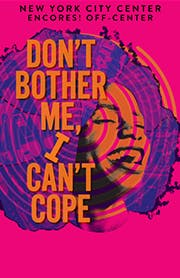 With music and lyrics from Micki Grant, Don’t Bother Me, I Can’t Cope (1971) is a celebration of African-American culture and community. Originally conceived and directed by the first African-American woman to direct on Broadway, Vinnette Carroll, this radical work presents the issues of race politics in America and raises voices for change through a lively mix of song and dance with a score that includes gospel, jazz, soul, calypso, and rock. Tony Award-winner Savion Glover (Bring in 'Da Noise, Bring in 'Da Funk) directs and choreographs the Off-Center revival, mixing his own artistic flair with Ms. Grant's score. Don't Bother Me is a homecoming of sorts for Glover—his mother and aunts toured with the show in the '70s. From his childhood to today's Off-Center audience, Don't Bother Me, I Can't Cope is as relevant as ever. The show premiered at the Ford's Theatre in Washington, D.C., before moving to Philadelphia and ultimately New York City where it ran for over 1,000 performances on Broadway, earning four Tony Award nominations including Best Musical, Best Original Score, and Best Book of a Musical. The show won an Outer Critics Circle Award for Best Musical, as well as a Grammy Award for Best Score from an Original Cast Show Album.